GitHub Is Now Where China's Tech Workers Vent Outside Reach Of Censors Without access to Facebook or Twitter, Chinese tech workers have gathered on GitHub, the world's largest open-source programming platform, to complain about 12-hour days and demand better conditions. 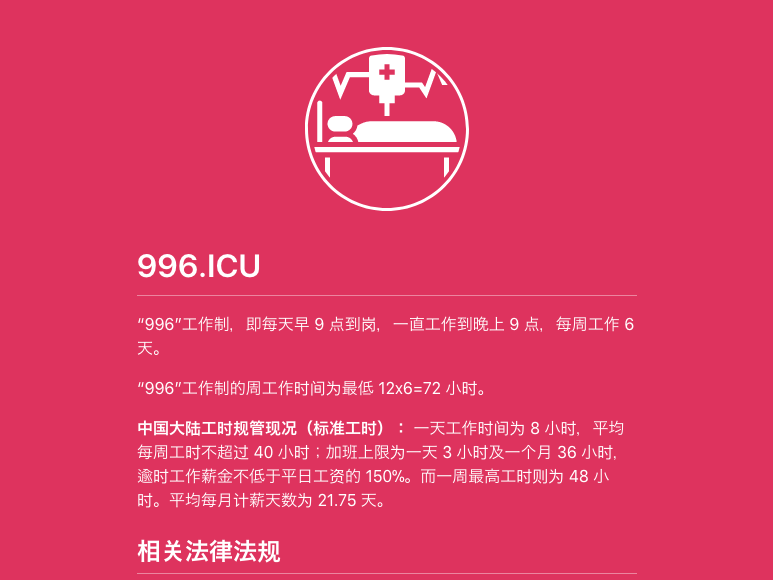 Created by Chinese programmers, 996.ICU has become a popular repository of workers' rights campaign materials on the website GitHub. The name is a play on a refrain that long work hours of 9 to 9, six days a week, could send tech workers to the intensive care unit. China's beleaguered tech workers have deluged GitHub in the past month with thousands of posts protesting "996" schedules — 9 a.m. to 9 p.m., six days a week — and demanding better working conditions. Tech-savvy programmers in the world's most thoroughly censored cyberspace are turning to unconventional means to collectively organize. They created a "repository," or collaborative project, on GitHub called "996.ICU," based on a joke that a 996 schedule will send you to the intensive care unit. It's become one of the most popular projects on GitHub, with more than 200,000 GitHub members following the project. The viral GitHub campaign puts Beijing in a tight spot: How do you keep China's Internet just free enough to enable economic development without opening the door to protest? The site's role as an influential platform for creating and sharing anti-censorship software tools within China has made it a target before. It was briefly blocked within China in 2013. Then in 2015, GitHub was briefly taken offline by a DDoS attack, or distributed denial of service — the largest recorded at the time — from servers later traced back to Chinese state telecom giant China Unicom. Access to certain pages and projects have been selectively disrupted. Over the past decade, Chinese authorities have systematically cut off other tools used to coordinate collective action, such as Twitter, WhatsApp and even Instagram. Popular domestic platforms, such as Tencent's WeChat app and the Twitter-like Sina Weibo, are increasingly monitored. "Other groups have not been able to have their concerns raised as prominently as we have. This is because normal Chinese media and social media platforms are heavily censored by the Chinese government and so their information cannot be shared to the public," a 996 programmer who goes by the alias Deleted Account tells NPR. Organizers also have crowdsourced an employers "blacklist" containing dozens of companies that they say have illegally forced employees to work more than 70 hours a week and written petitions to Chinese government ministries, including the state labor union. "It remains to be seen if the government does make a request for Microsoft to take down these projects ... and whether Microsoft will be willing to play ball," Griffiths said. "This could be a really important test for Microsoft and for GitHub."